2016 Lexus IS Pros and Cons: Why (Not) This Car? When the third-generation Lexus IS was introduced as a 2014, though, it retained a 204-horsepower 2.5-liter V6 as its base engine. With less power and far less torque (essentially low-end and midrange power) than a turbocharged four, this V6 delivered underwhelming performance and so-so fuel economy. I did not recommend the IS 250 for anyone with the slightest interest in driving. The IS 350 was a far better (but also significantly more expensive) choice. For 2016, the IS finally joins the 2.0T crowd. As does the competing Infiniti Q50 (with a Mercedes engine). Is either a compelling option for driving enhusiasts? Or is a big V6 still the only way worth going? More broadly, why buy a Lexus IS when this segment is crowded with quite a few other excellent choices? Not as upscale as some others, but refreshingly different. I like the 1980s retro vibe. Why the 2016 Lexus IS? No matter how much Lexus improves the IS, the primary reason to buy one instead of something European or American (or even the Infiniti) will likely remain reliability. Audis and BMWs have become more reliable during the first few years of ownership, but once out of warranty they remain frightening propositions. Many remain reliable. But some owners live horror stories. The Infiniti Q50 has done well in TrueDelta's reliability survey but poorly in others. The key difference: we don't count software-based or usability issues that others do. The Q50's infotainment system has had issues. The G35 / G37 that preceded the Q50 has tended to be a better out-of-warranty bet than the Europeans, but some owners experienced excessive oil consumption and the odds of getting a lemon were higher than with the Lexus. I don't like the exterior styling of most current Lexus models. The large spindle grille, bizarre surfacing, and awkward proportions of the crossovers especially don't work for me. 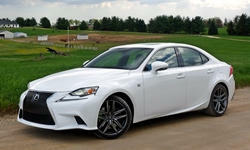 But I like the looks of the GS midsize sedan in F Sport form, and I really like the exterior of the trimmer, sleeker IS. Lexus ventured some interesting twists with the surfacing of the compact sedan's body sides, yet unlike with the crossovers the whole is well-proportioned and coherent. I especially like how a line from the rocker panel curves upward to meet the descending rear pillar, and how the virtual point this forms is echoed in the side window outline. The spindle grille even works. Not only do I find the IS the most attractive Lexus, but I might find it the most attractive car in the premium compact sedan class. In comparison, the Q50's exterior appears bland and unathletic. The exterior of the Mercedes C-Class is more elegant but a little heavy through the rear quarters and less interesting. And the BMW 3 Series? Attractive, but not memorable. Everything is close at hand. Note LFA-inspired instruments. 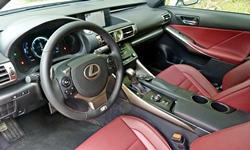 My feelings about the Lexus IS's interior are more mixed. In some ways, the styling and materials are more Toyota than Lexus. The instrument panel and center console include a surprising amount of hard black plastic. But their rectilinear, strongly horizontal styling and detailing recall the Japanese designs of my youth, of which I remain fond. The look differs dramatically from what you'll find elsewhere in the class. In terms of materials and an upscale ambiance this interior isn't in the same league as that of the Mercedes-Benz C-Class. Like that of the first-generation IS, if to a lesser extent, the latest car's interior might suit a Toyota better than a Lexus. Still, I like it. The F Sport package includes an LCD tach plus digital speedometer styled like that in the LFA supercar. The tach motors to the right when you desire to view the trip computer (in a second LCD just behind the one that moves). I tended to select the boost gauge option in said trip computer. The non-F'd IS has more conventional instruments, with a smaller multi-function display between an analog tach and speedometer. The Infiniti Q50's interior looks and feels more plush, but also appears less sporty and distinctive. For me, the front bucket seats in Lexus F Sport models provide a nearly ideal blend of comfort and support. Even when they don't lack lateral support, the seats in competitors don't fit my form as well. Infiniti doesn't offer the Q50 2.0t in Sport form. The standard car's front seats provide little lateral support. The instrument panel appears larger and more imposing in the Infiniti than in the Lexus. Still, I wish the view forward were a little more open in the latter. (The Cadillac ATS is better in this regard.) Lexus lowered the driving position compared to the previous IS to help the car feel sportier. I raised the seat some to compensate. Adding all-wheel-drive to the Lexus IS (and a V6 engine with it, AWD isn't offered with the 2.0T engine) adds another issue, a large hump beneath the driver's right calf. Some drivers might find they have to adjust how they sit to avoid this hump. Why Not the 2016 Lexus IS? With 241 horsepower and 258 pound-feet of torque, the new turbocharged 2.0-liter four-cylinder engine in the Lexus IS 200t has much more competitive specs than the 204-horsepower, 185-pound-foot 2.5-liter V6 it replaces, and more power than the 208-horsepower, 258-pound-foot Mercedes 2.0T in the Infiniti Q50. In reality, it feels about as quick as the Infiniti but short on grunt and thrills compared to the 2.0T engines in the Audi A4 and BMW 328i. The new Lexus engine could be refined to a fault. Boost comes on so gradually there's no evident transition. Compared to competing turbo fours it's smoother and much quieter, with a high-frequency tone to the noise that penetrates the sound insulation. The BMW engine in particular sings a lower, louder song and sounds and feels more energetic. The IS 200t's eight-speed automatic could deserve some of the blame. It shifts very smoothly from gear to gear, but doesn't react as quickly or as decisively as others. Whether owing to the programming of the engine or the transmission, my connection to the team felt less than direct or immediate. While I found the car quick enough--it's probably quicker than the Infiniti--I found few thrills through the go-pedal. For performance-minded drivers, the 306-horsepower, 277-pound-foot 3.5-liter V6 in the IS 350 remains the way to go. It's a splendid engine even if it lacks the brute power of the boosted sixes in the Audi, BMW, Infiniti, and Mercedes. The new 2.0T engine might pair better with a manual transmission, but Lexus continues to not offer one in the IS. Beyond this omission, there are few others (aside from no leather option in the F Sport; the Nu-Luxe synthetic does a good impersonation). In general, if you can get a feature in a competitor you can get it in the IS. Best execution of the Lexus spindle grille. The front end styling will be revised for 2017. Decent room, but the size and low position of the cushion remain those of a compact sedan. At 10.8 cubic feet, the trunk of the Lexus IS is among the smallest in the class. That in the Infiniti is a few cubes larger. The BMW's trunk is much larger than the others, if the official 17-cubic-foot spec is comparable. One helpful change from previous generations of the Lexus IS, and from the Infiniti G37/Q50: the rear seat now folds (with a 60/40 split) to expand the trunk. When I evaluated the Lexus IS 350 F Sport, I found its ride quality a "why to buy." Now, with the IS 200t F Sport, I'm finding its ride quality a "why not to buy." Part of the reason could be that I drove the latter on a wider variety of roads. But the 200t also lacks the 350's adaptive dampers. Perhaps for this reason, it can feel jumpy even on roads that appear smooth. In daily driving this could prove tiresome. The suspension does absorb larger bumps fairly well. The IS 200t F Sport's ride rarely if ever feels harsh. Road noise levels are a little higher than in most other cars in the class. In this way as well as some of the interior materials the IS feels more like a Toyota than a Lexus. I personally appreciate this for the greater involvement it enables. For me, the primary attraction of a BMW 3 Series or one of its many challengers for the throne is, or at least should be, how it handles. Smaller, lighter cars tend to handle with more agility and to be more fun to drive. Even with a four-cylinder engine, the Lexus IS is among the heavier sedans in the class. In fact, the car's curb weight is somehow only ten pounds lighter with the 2.0-liter four than with the 3.5-liter V6. This isn't how it's supposed to work. Despite the car's 3,583-pound curb weight, the Lexus IS does feel light and agile, so this part of how it handles works well for me. The Infiniti Q50 in particular feels larger and heavier. In sport mode the steering has a pleasant heft to it, and provides a decent amount of feedback. In comparison, the Q50's steering feels numb. When I push the IS harder, though, I can't quite connect with it, and am inspired with less confidence than in, say, a Cadillac ATS, the handling champ of the class. Overall, the IS's handling is about 90 percent of the way to where it needs to be. Closer than most, but not quite there. The stability control system permits slightly more oversteer than I recall from the IS 350 a couple years ago, but this is just slightly more than none at all. Lexus still offers no performance mode for the stability control system. You still have to choose between too much intervention and none at all. With the turbo four engine and eight-speed automatic transmission, the Lexus IS's EPA ratings improve from 21 mpg city, 30 mpg highway to 22/33. Given that the highway rating improved much more than the city rating, more credit seems due the transmission than the engine. The Infiniti Q50 2.0t scores about the same as the Lexus, 23/31. The BMW 328i and Mercedes-Benz C300 have the best EPA ratings in the class, 23/35 and 25/34, respectively. The 2014 redesign added a couple of much-needed inches to the rear legroom of the Lexus IS. I have plenty of knee room sitting behind my 5-9 self. As in other cars in the class, though, the cushion is positioned too low to the floor to provide adults with thigh support. Comfort is in shorter supply than room. The rear seat in the Infiniti Q50 is somewhat roomier and somewhat more comfortable. Audi, BMW, Cadillac, Infiniti, and Lexus all offer premium compact sedans with significantly lower starting prices than the $38,275 Lexus IS 2.0t. But in the cases of the BMW and Cadillac the base engine is considerably weaker. Compare comparably equipped cars, and the Infiniti remains about $3,000 less expensive than the Lexus, while the Cadillac costs about the same and the European cars cost more. Ultimately, my evaluation of the new Lexus IS 200t is mixed. The new turbocharged four-cylinder engine, while better than the small V6 it replaces, doesn't stand out in terms of performance or fuel economy. I enjoy driving the IS, as it feels lighter and less insulated than most competitors, but it doesn't handle as sharply as the Cadillac ATS or maintain its composure as well as the Cadillac or European competitors when pressed. Interior materials and the level of refinement are in some ways more Toyota than Lexus (which isn't entirely a bad thing). Ultimately, even with the new engine the strengths of the Lexus IS remain the same. It's distinctively styled in and out (and I happen to really like its styling), it's reasonably priced compared to competitors, and it's likely the most reliable car in the class. It remains the car to get for people who want a European compact sport sedan, but without the potential headaches. In comparison, the Infiniti Q50 2.0T looks and feels more like a luxury sedan, but doesn't stand out in any way save a low starting price. At least when comparing four-cylinder cars, I prefer the sportier, more distinctive Lexus. The new turbocharged four-cylinder engine. Better than the small V6 it replaces. Small trunk. At least the rear seat folds. Lexus, Cadillac, and Mercedes provided insured cars for a week each with a tank of gas. Jean Joseph Limage II at Suburban Infiniti of Novi helpfully provided a Q50 2.0T for a test drive. 2016 Lexus IS pros and cons, according to Michael Karesh: the best reasons for buying (or not buying) the 2016 Lexus IS. Join TrueDelta to post your own impressions.